What yellow pages website theme is the best? We’ve compiled a list of the top 10 yellow pages website scripts to create your business directory website. These yellow pages software options will allow you to quickly and easily build your very own yellow pages directory – create a local yellow pages website or a national business directory. Included in this list are dedicated directory platforms, WordPress themes and PHP scripts. Each option has its own benefits which we will list, but you may find that an all-in-one directory platform will be easier to use than a generic WordPress theme. What Features Should a Yellow Pages Theme Have? Before we move forward, let’s discuss the different options you have for starting your yellow pages website. You can either use a dedicated directory platform, a theme or a script. So what’s the difference between these options? A dedicated platform typically has everything you need under one roof – hosting, design settings, content publishing tools, member management, payment processing, email management and more. A directory platform should be an all-in-one turn-key solution that allows you to launch your yellow pages business directory as quickly and easily as possible. These solutions usually also offer dedicated technical support. Searching for themes will typically yield more results than the options available for a dedicated platform. However, with a theme still requires a platform for it to be installed on. The most common themes are for WordPress which is an incredibly popular blogging platform. But there lies the issue – WordPress was designed for publishing articles, not for managing a yellow pages website. There are plenty of good yellow page themes for WordPress, but you will need to use a handful of other plugins to add necessary functionality to your site such as payment processing, member management and more… and you’ll have to hope that all of the plugins work well together so that your site functions properly. You will also need to purchase hosting from a hosting provider and install WordPress on your server. Because of this, the level of support available will vary depending on the developer of your theme and plugins. The last option would be to use a yellow pages script. These are typically PHP yellow page scripts that you can download. But you will need a good amount of technical knowledge as you will need to manage your own hosting and, just like with WordPress, install the script on your server, manage your own hosting, databases and more. And again, technical support varies widely depending on who developed the script. 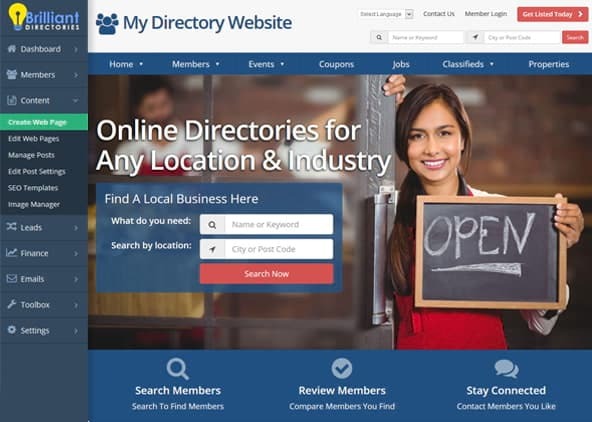 Brilliant Directories has consistently been rated by users as the top directory and yellow pages website software tool since 2010. Brilliant Directories makes it easy to manage your website, business listings, users, payments, email notifications and more. Over 10,000 groups, organizations and website owners around the world trust Brilliant Directories with their online communities and yellow pages websites. With Brilliant Directories you can choose from over 15 different yellow page themes for your directory website. Start your free trial website by clicking here. You’ll be able to have your yellow pages business directory website completely set up and designed in just a few hours. There’s no restrictions – you’ll have access to all of the great features, from member and content management to connecting your payment gateway. I first tried using WordPress themes but the plugins I needed to run my business directory website kept breaking. Brilliant Directories is a truly hassle-free, one stop shop platform. If you want to explore more options, listed below are 10 other yellow pages website software tools. The list is sorted alphabetically and includes each tool’s major features, price and the level of support you can expect to receive. Business Directory Plugin is currently the most popular yellow pages business directory WordPress plugin with 20,000 active installations. It’s so popular because the core plugin is free and includes many, but not all, of the necessary features a yellow pages website should have. Premium modules, which must be purchased separately, are required for additional functionality such as claimable listings, Google Maps, business ratings, payment gateway support and more. Business Directory Plugin does not have any direct or immediate support, but they do offer a public support forum. Brilliant Directories is the most popular turn-key all-in-one online business directory software, currently powering over 20,000 websites. It has all of features you’ll need to successfully manage your yellow pages website – managing members and businesses, publishing content, accepting recurring and one-time payments, automated email notifications for businesses, a full self-service member dashboard, lead management and more. Listed businesses will have their own profile pages with a live Google map, business details, images and more. A claimable business listings add-on is available to add that functionality to your website. Businesses can also be reviewed by their customers and security and feature updates are pushed regularly. 15+ website themes are available with Brilliant Directories including their top-rated best Yellow Pages Theme. City Portal Yellow Pages is a free yellow pages website template by Free Templates Online. It’s a relatively simple yellow pages directory with basic business listings sorted by category. This template is mobile responsive, but because it is offered for free it does not come with any support, dropdown menus and it not optimized for search engines (SEO). This yellow pages website template is, however, relatively customizable as you will be downloading the raw HTML and CSS files. Also provided are some Photoshop files (PSD) to edit design elements. DirectoryEngine by EngineThemes allows you to create a local yellow pages website with membership packages, edit the website’s design, it includes a drag-and-drop content editor and many local payment gateways have supported integrations to process payments. Only 12 months of updates and support are included and depending on what package you purchase, you may need to buy additional extensions for enhanced functionality such as user ratings, coupon codes, additional payment gateways and more. Just like with other yellow pages scripts, ezydir is a PHP script that needs to be installed on your own web hosting account or private server. However, ezydir does have a backend admin panel to manage your yellow pages directory. Features include basic business listings, geo location functionality, an integrated payment gateway, user management, multi-language support and more. Where ezydir falls short is with support. You will need to be extremely competent with coding and website management as ezydir is PHP script and not an all-in-one platform, but they also do not offer any support or updates despite the $1,200 price tag. GoClixy is another PHP local yellow pages website script that needs to be installed on your own web hosting account or private server. GoClixy does have several available themes, bulk member import/export, searchable business listings, a mobile app, multi-language support, and more. Again, you will need to have experience with website management since GoClixy is a PHP script and it only comes with one year of support. Yellow Pages Script by PHPJabber is a stand-alone PHP script for building a yellow pages business directory. A back-end admin interface will allow you to create unlimited categories, add business listings and more. Additionally, Yellow Pages Script has SEO tools, integrate PayPal checkouts and interactive Google maps – a feature that many all-in-one platforms have, but most scripts do not. The front-end of the site, however, is extremely simple and bare-bones. Minor updates and support are included, but again, this script will need to be installed on your own web hosting account or private server. PHPJabber does, however, offer a remotely hosted scripts service. A Developer License is available for purchase that will allow you to make code changes to the PHP directory script. Yellow Pages Script by PHP Only is, as the name suggests, a PHP script with support for free and paid listings, photos, maps, search engine-friendly URLs, unlimited categories and subcategories and more features. If you’re comfortable with all the required technical know-how, then this Yellow Pages Script may be a better option than some of the others because updates and support are included with it. You can even purchase installation so you don’t need to install the script yourself on your web hosting account or private server. Yellow Pages Script by Subrion is the last PHP script on our list. With this yellow pages PHP script you will be able to manage an unlimited number of locations, categories and business listings, manage reviews, create custom form fields and more. Free and premium extensions are available for additional functionality such as adding share links, banner ads and more. Subrion offers 6 months of support with the purchase of a license, though a community forum is available. Of course, as with the other PHP yellow pages scripts, this one will also need to be installed on your web hosting account or private server. 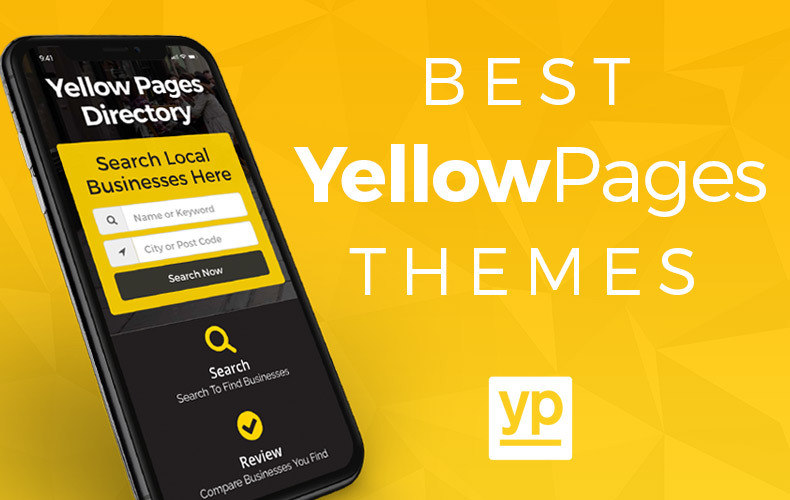 YellowPages is a child theme for Templatic’s directory themes for WordPress. Templatic provides the same basic features as the other WordPress yellow pages themes such as maps, customizable listings, a front-end submission module, design settings and more. Templatic utilizes more third-party WordPress plugins than many other themes listed here. This is good in that it provides you with more features and greater functionality. However, it can be a major drawback as plugins are not always compatible with one another and updates are pushed irregularly if at all. So you will be trusting that a theme and several plugins from many different developers will all continue to work perfectly together… otherwise your site won’t function properly. WordPress Themes vs. Brilliant Directories – Which Is Best For You?